At Southeastern High School, Scott is known to alumni, students and faculty as one of their own, a former Jungaleers’ star who continues to share his success with his alma mater and hometown. 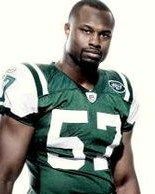 As part of the Southeastern High Alumni Association’s annual reunion block party and picnic this Saturday (July 9) on school grounds (3030 Fairview, Detroit), Southeastern will honor the 1998 graduate by naming its football field and track “Bart Scott Field.” The ceremony is expected to start at 2:30 p.m.
Scott, 30, was signed as an undrafted free agent by the Baltimore Ravens in 2002 after playing collegiately at Southern Illinois University. He signed a six-year, $48 million contract with the Jets prior to the 2010 season and has remained generous toward Southeastern. In 2005, he bought new uniforms and equipment for the school’s football team and upgraded the weight room in 2007. Last fall, Scott paid for new bleachers and fencing after vandals stole the old bleachers and forced the Jungaleers to play all but their last “home” game at other venues. In tribute to Scott’s contributions on the field and off, Southeastern retired his jersey in 2008. Scott and his wife have a son and a daughter. He is slated to be present Saturday among other friends and family who are also Southeastern graduates. This entry was posted in Boys, Events, News and Press Releases, Sports.